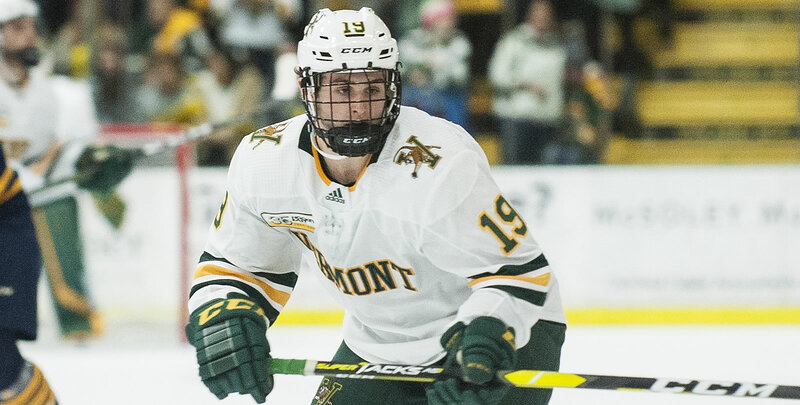 BURLINGTON, Vt. - Liam Coughlin broke the Catamount scoring drought at 14:32 of the first period as Vermont took a 4-1 win over New Hampshire in front of a sellout crowd on Fan Appreciation Night at Gutterson Fieldhouse. Vermont improves to 12-14-2 overall (5-11-2 HEA) while New Hampshire drops to 11-10-8 overall (7-7-5 HEA). "We had jump in our step right from the opening faceoff all the way through to the end," head coach Kevin Sneddon said. "Certainly not without some great performances from Stef on some key plays. We got it from the net out tonight." - Stefanos Lekkas made 13 first period saves, including three in rapid succession halfway through the period to keep the game scoreless. - Coughlin broke the deadlock on UVM's third power play chance of the opening period. The senior put home Vermont's third shot of a net-front scramble following a pair from Alex Esposito. Matt Alvaro assisted on the goal with Esposito. - Sneddon called timeout at 2:55 of the second period with UVM facing 60 seconds of 5-on-3 play in the midst of an extended UNH power play. UVM held the Wildcats to three shots over the three minute advantage. - Freshman Johnny DeRoche made it 2-0 Cats with his second goal of the season at 6:10 of the second frame. He picked up a Conor O'Neil rebound and roofed the puck over a sprawled Robinson. Ace Cowans was credited with the secondary assist. - Bryce Misley added his second goal of the season just 1:20 after DeRoche's tally to make it 3-0 Vermont. Misley backhanded an off-angle shot towards Robinson that snuck through the sophomore netminder. Vlad Dzhioshvili and Craig Puffer picked up assists on the play. - New Hampshire cut into the Catamount lead with 11:47 remaining in the third period. After a faceoff win in the Catamount zone, Wildcat captain Marcus Vela tipped a shot from Richard Boyd past Lekkas. - Matt O'Donnell's fifth of the season made it 4-1 Catamounts with 5:42 left in regulation. The captain unloaded on a slap shot from the top of the right circle as a New Hampshire penalty expired. DeRoche and Cowans assisted on the third period tally. - Lekkas finished the game with 31 saves, marking the 15th time this season the junior has finished a game with 30 or more saves. Lekkas made 57 saves over the weekend while allowed just two goals. - Vermont's PK unit killed all four UNH power play chances and all seven Wildcat power play chances over the weekend. Vermont has killed off 16 consecutive penalties. - UVM holds a 9-7-5 record against the Wildcats dating back to the start of the 2011-12 season. UVM has a plus-2 goal differential in those games. - For the second straight year, the Catamounts take a win over UNH on February 9. UVM took a 2-1 win last season at the Whittemore Center. - The first 500 fans in attendance at tonight's sellout received a Vermont hockey jersey, courtesy of People's United Bank. Fans won several prizes throughout the night. - With the victory, the Cats Win, Community Wins campaign and Vermont Mutual Insurance will donate $100 to Make-A-Wish Vermont, bringing this year's total to 28 wins and $2,800. Vermont returns to the road for a pair of Hockey East games at 13th-ranked Northeastern (16-9-1, 9-7-1 HEA) next weekend. The puck is slated to drop at 7:05 p.m. on Friday (Feb. 15) and Saturday (Feb. 16) at Matthews Arena.